Conventional Civil War wisdom has it that Pickett's Charge represents the Confederacy's "high tide" at Gettysburg. But Phillip Thomas Tucker's thoroughly researched, if highly over-written, analysis of the attack by Brigadier General William Barksdale's Mississippi Brigade against Union forces in the Peach Orchard on the afternoon of July 2 presents substantial evidence for his claim that Barksdale's attack "came closer to achieving decisive success and winning it all for the Confederacy than any other assault of the battle." 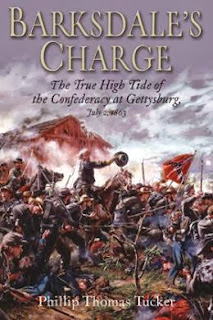 Tucker has clearly spent substantial time in the Mississippi Department of History and Archives unearthing interesting, if not always informative, anecdotes about the 1,600 officers and men of the 13th, 17th, 18th, and 21st regiments, four of the eleven Mississippi regiments in the Army of Northern Virginia. Veterans of every major engagement in the east since the war's opening salvoes, the yeoman farmers and sons of Mississippi's planter elite had "acquired a reputation for ferocity, combat prowess, and lethality" at the mouths of Union cannons on Malvern Hill and in the rubble strewn streets of Fredericksburg. They were led by a successful lawyer and politician with an egalitarian sensibility. Sprung from humble roots, Barksdale's only previous military experience was as a staff officer during the Mexican War. Nevertheless, he quickly became a successful combat commander and a firm disciplinarian with a reputation as a soldier friendly officer who could always be found at the front of his men. At the end of the Seven Days campaign, Robert E. Lee declared that Barksdale exhibited "the highest qualities of a soldier." The sweltering afternoon of July 2 found Barksdale's Brigade, part of James Longstreet's First Corps, in the cool shade of Pitzer's Woods facing Joseph and Mary Sherfy's peach orchard. What they saw across a gently rolling field was a field commander's dream: an entire Union Corps, Daniel Sickles' Third, thrust out in a salient "hanging in the air," and vulnerable on three sides. Tucker correctly concludes that "More than any other Southern unit because it directly faced the Peach Orchard, the Mississippi Brigade was now in the key position to exploit the tactical vulnerability of Sickles' salient." After breaking through Sickles' front, Tucker contends, "the successful assault could be continued east all the way to Cemetery Ridge and the fulfillment of Confederate dreams." Tucker insightfully conveys the feelings of Barksdale and his men as they waited impatiently for the order to advance. When the order finally came, Tucker asserts, "it was Barksdale's charge more than any other that would reap the fruits of victory, or else signal the failure of Confederate strategy." What happened next and why has been the subject of debate among old soldiers, historians, and Civil War enthusiasts ever since. Those questions include whether the honor of achieving the Confederate high water mark. In addition to Pickett's Virginians and Barksdale's Mississippians, some historians bestow the honor on the Georgia regiments of Brigadier General Ambrose Wright. All agree, however, on the bravery of the Mississippians in the face of superior numbers and overwhelming artillery fire. The Brigade lost about 800 officers and men, including its commanding general. Unfortunately, Tucker's scholarship is often overtaken by his purple prose. He seems to have never met a cliche he didn't like or an adjective he didn't use. An editor with an old fashioned red pencil would have benefited author and reader alike. Nevertheless, this monograph takes a detailed look at an event in a battle about which so much has been written.